The diversity in health systems, legislation, governance structures, and public opinions makes it difficult to take decisions about where and how to invest in big data technologies. 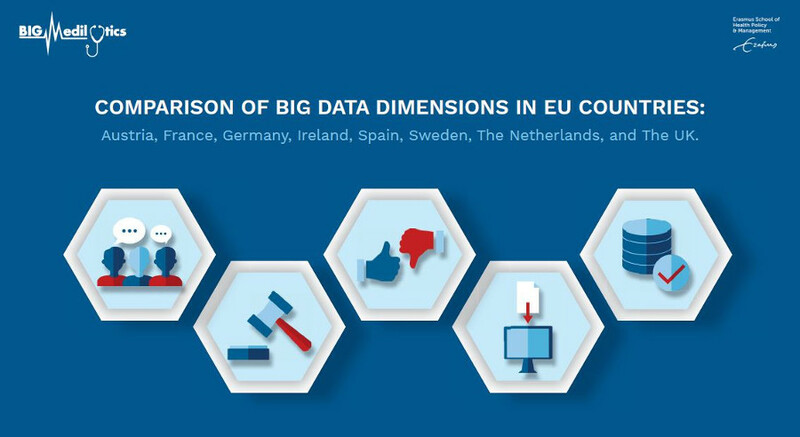 In order to respond to these issues, the Erasmus School of Health Policy & Management has developed eight country-specific infographics on the relevant European and national regulations for the collection, management and use of big data (technologies) in healthcare. These infographics are focused on Austria, France, Germany, Ireland, the Netherlands, Spain, Sweden, and the United Kingdom. The infographics summarize the main matters in relation to regulation, governance, and public opinion. They offer practical advice and considerations to take into account. In Spain, for example, the ethical debate primarily takes place amongst experts, while in France and the United Kingdom the discussion is more public. In Germany, the General Data Protection Regulation (GDPR) suits well with the regulatory framework for data collection in place, while in Ireland the embedding of the GDPR is less straightforward. One additional infographic compares the eight countries on major themes: digitalization, governance, regulatory challenges, ethical debates, and social and cultural norms. This additional infographic will allow policymakers at the national and European level to learn from initiatives and approaches in other countries. social and cultural influences on the practices and regulations of big data in the country. The nine infographics are now publicly accessible in the deliverable under the title Country specific infographics that summarize the relevant regulations for big data technologies in the healthcare sector, created within the work package 5 of the BigMedilytics project. Led by Erasmus University Rotterdam, this work package aims to deliver knowledge about the rules for the use of big data in healthcare, to measure the increase in productivity, and to maximize the impact of the pilots. For more information, please contact Dr. Anne Marie Weggelaar (weggelaar@eshpm.eur.nl).